The Little House on the Prairie series by Laura Ingalls Wilder was one of my favorites growing up. The stories and images of life on the prairie became part of me before I moved to Colorado. The series depicted American Pioneers who traveled west in the late 1800’s in search of land only previously settled and utilized by native populations. Growing up I have clung to this idea of a more simplistic way of life. Pioneers had often difficult lives, but they had the freedom to travel to unknown territories. They settled and built themselves houses and farms to live a life connected to the rhythms of nature. They worked hard to provide the basic human needs for themselves and their families, and populated the Great Plains and eventually the West of America. Without their courage to search for a better way of life, it’s easy to say the West would be a very different place. However, it’s also necessary to acknowledge the native people who lived on this land long before it became divided into a country or state. Some nomadic tribes hunted and gathered, following the herds of buffalo throughout the prairie ecosystems. Other native people lived semi-sedentary lives and farmed as well as traded goods with other tribes. They were all moved by the seasons, and an intricate part of the West before the expansion of white culture. 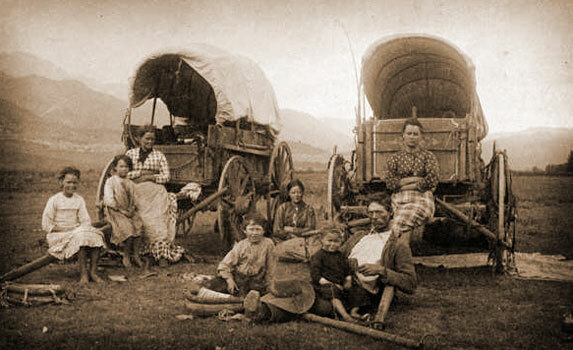 Pioneers traveled from Eastern America to the West in Covered wagons. Some as long as 18 feet long and able to carry 12,000 pounds. This is a very similar size to the tiny house I’m building to live in full time. It’s just enough space to live comfortably with my most necessary belongings. I love that each part of the tiny house must have multiple functions. This is a key principle in Permaculture Design, and one that I have tried to integrate into my daily life thus far. For example, all of my furniture will have built in storage, and my couch will also fold out into a queen size guest bed. I have enjoyed the process of creating my design and building elements after months of research. I am fortunate to have the privileged choice of living in a smaller space. Most humans throughout history have lived in small spaces, multiple people sleeping to one room. Within the last hundred or so years houses have gotten larger, disconnecting people from their natural environments, and making close living quarters uncomfortable to many. However, these people who live in grander environmentally destructive houses have chosen to do so, and have economically been able to assert their status with the size of their homes. 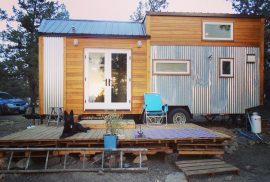 It has become the status quo, while many people still live in motorhomes, tiny inner city apartments, or ghettos comprised of small living quarters. Often these people live in smaller homes for economic reasons, but if given the choice might enjoy more space. 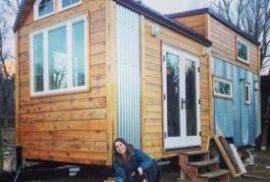 The tiny house movement seems to be white dominated, and by people who have known what it feels like to live in excess, and to have more space than is needed. However, they choose to consume less, and it gives the option for young and old folks to live a different type of life. 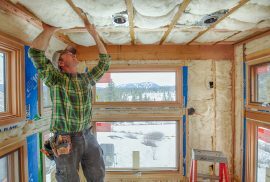 For many young people it offers the freedom to not be tied down to a place or mortgage, and to build a personalized space. That being said, I am fully grateful to have the opportunity to build myself a tiny house. I’m so proud of you!!! I love you! Great concept Isabelle! Can’t way to see the progress. So nice meeting you today Isabelle on Isabelle Road, one of my favorite country roads in Colorado! And to think you now have two hand sewn quilts from the plains of Nebraska ~ or beloved prairie land. It touches my heart that they found their way to you and will be in your new home. May all your dreams unfold beautifully, and I wish you the very best every step of the way!